Mycopan is currently represented by a single species, Mycopan scabripes. It is fairly difficult to recognize without extensive experience, since no macroscopic character (or even combination of macro-characters) is definitive. 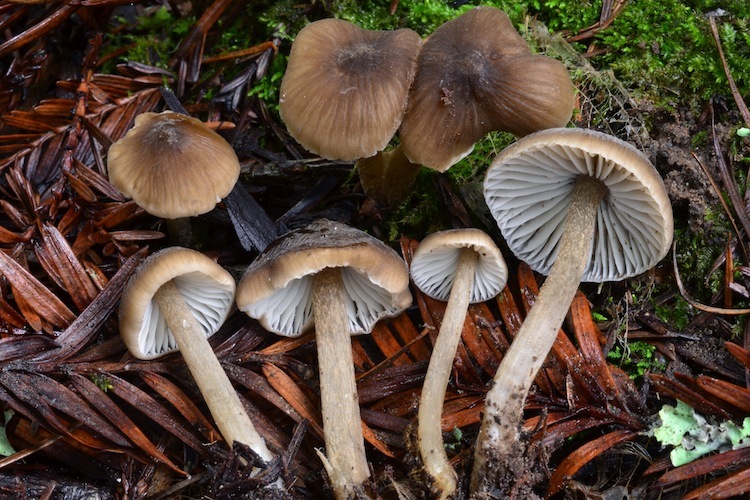 However, the slender but moderately-sized fruitbodies (larger than Mycena, Hydropus, the smaller types of Lyophyllum and most Rhodocybe), rather dark cap, and strongly scurfy stipe are good clues. Little is known about this species, but it is thought to be saprobic, and appears to be fairly widely distributed. The type species is known from our area, where it is occasionally found in late winter and spring. Identification issues have likely caused it to be underreported, so it may be more common than we currently understand. Identification is difficult, depending primarily on separation from other genera. Mycopan Redhead, Moncalvo, Vilgalys, gen.nov. Basidiomes mycenoid, sordid. Pileus hoary to pruinose, becoming naked and polished, moist to lubricous. Lamellae whitish to greyish. Stipe fibrillose to furfuraceous, with sordid grey fibrils. Basidiospores amyloid, hyaline, thin-walled. Pleurocystidia and cheilocystidia fusoid ventricose to cylindrical. Pileocystidia and caulocystidia scatter, similar to hymenial cystidia. Tissues nonamyloid. Holotype: Prunulus scabripes, Murrill 1916. Phylogenetically in the Agaricales closest to Baeospora (Moncalvo et al. Mol. Phyl. Evol. 23: 357-400. 2002). Habitat: On plant debris in soil. Etymology: An allusion to mythical Pan and his furry legs and woodland home.